I loved boxed granola. I thought it was the greatest thing since sliced bread, and since I'd sworn off all bread, it was a wonderful alternative. I would layer it with blueberries and a banana, sometimes having two bowls. That is until I say how much calories and sugar it had in it. 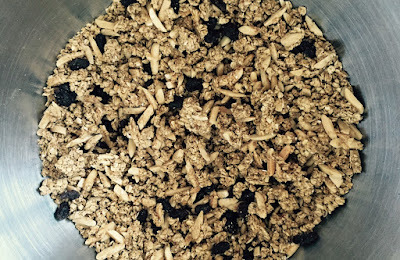 I had added granola to my list of no-no's until I found this recipe by Bethenny Frankel, celebrity chef and Real Housewife. I made this for the second time yesterday, and it makes the whole house smell wonderful, like fresh baked oatmeal cookies. The recipe is actually pretty simple. You can find the full recipe here, though I used raisins and apples. The apples I prepped myself. I took one apple and cut it into small pieces, about half a centimeter long. I let them air dry over night. They made a great addition to the cereal! 1. Preheat the oven to 300 degrees F, and oil one large sheet pan. 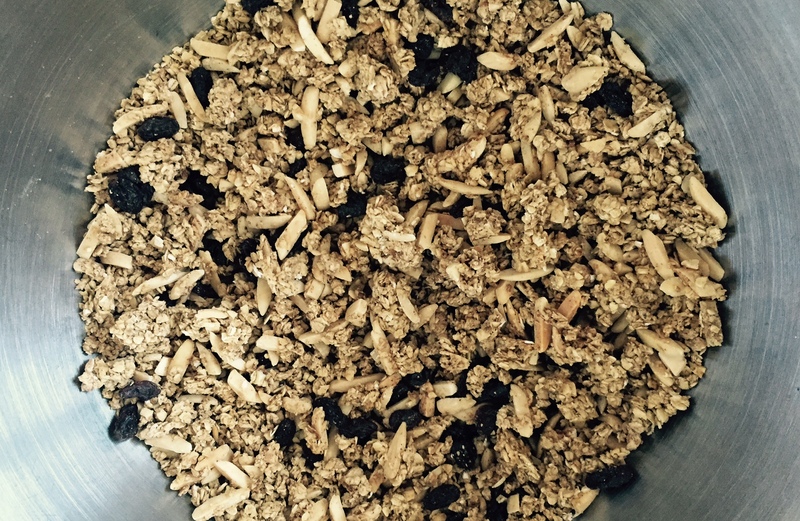 In a large bowl, stir together oats, almonds, and spices. In a small bowl, stir together the warm water, maple syrup and vanilla. 2. Pour the wet mixture over the dry mixture and stir to combine well. Spread the mixture onto the sheet pan and bake for 30-45 minutes, making sure it doesn't burn. 3. Remove from the heat and immediately stir in dried fruit. Cool and store refrigerated in an airtight container up to one month.